If you’ve ever wanted to see how far Web browsing has come over the years, I’ve got the perfect site for you. 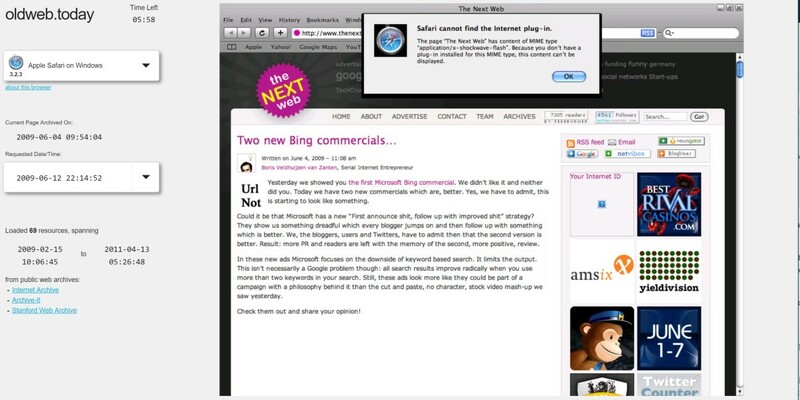 Oldweb.today lets you revisit websites in their days of yore. Of course, it’s not the first to do so – the Internet Archive is an excellent resource – but the difference is Oldweb lets you recreate what it actually felt like navigating the Web back in the day. To do so, the tool emulates old Mac, Windows, and Linux platforms, including browsers like early versions of Safari, Internet Explorer and even Netscape. It even appears to limit your connection speed to give you a sense of how long it might have taken to actually open up the site; trying to load an old version of thenextweb.com was unbearably slow. No dial-up sounds are included, however. It’s a fun tool to play around with, though if you want a blast from the past on your native browser, you can always just check out the official Space Jam website, which is somehow still running.